Perhaps the best part of watching Hit the Road: India — a documentary about an auto rickshaw race from Mumbai to Chennai — is knowing that I don’t have to run the race myself. The movie follows two North Americans as they pilot a tiny, unreliable vehicle across India for an adventure that is equal parts beautiful and terrifying. The race is the Mumbai Xpress, part of a series of road races that make up The Rickshaw Challenge. All of the races require participants to drive auto rickshaws: the dinky, three-wheeled vehicles ubiquitous in Indian cities. Auto rickshaws are designed for quick urban jaunts, not highway driving. The vehicles driven by the racers have no doors, seat belts, or windshield wipers, a barely functioning headlight, and an engine that puts out a whopping seven horsepower. Our guides in Hit the Road: India are Canadian chef Keith King and Chicagoan Ric Gazarian, who works in real estate. They are the least organized of the six teams competing, eschewing maps and GPS in favor of, well, who knows? The twelve-day, 1,900 km race starts with the simple-sounding yet nerve-wracking task of getting out of Mumbai. Overloaded motorcycles dart in between humongous trucks, nearly clipping the small, slow auto rickshaw driven by two guys who elected to pack a Spider-Man mask and an Elmo costume for a trip through rural India. Once out of Mumbai traffic, it’s surprising how quickly the city fades and the scenery becomes lush and green. What’s delightful about seeing India from this perspective is realizing how much beauty exists in areas that Bollywood filmmakers tend to ignore. Part of that has to do with when the race takes place. It’s run in August during monsoon season, a time when it doesn’t make financial sense to shoot a film outdoors. However, the overcast August skies make the greenery more vibrant and augment the power of the churning ocean waves. 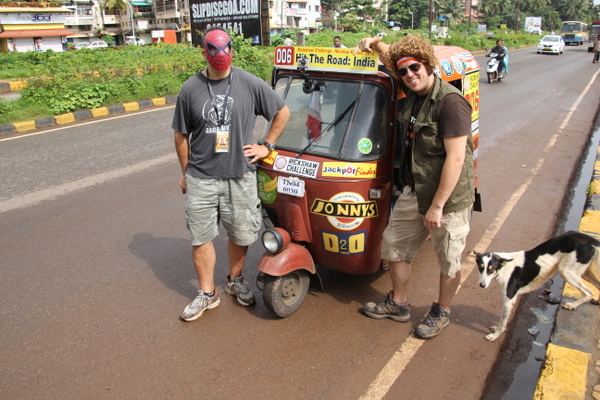 Virtually all of the drama in Hit the Road: India is due to Ric & Keith’s decrepit vehicle. It burns through gas at a furious rate, and it needs a new engine after just a few days. The long drives up winding hills are as hard on the rickshaw as they are on the drivers. As funny as some of the mishaps are — like when Ric loses a shoe while lifting the rickshaw out of a watery ditch — it’s impossible to ignore the real danger of the race. The men must navigate potholes while avoiding driving into the path of annoyed bus drivers. Rural roads are poorly lit at night, so one could hardly blame a bleary-eyed trucker for failing to notice the sputtering little auto rickshaw in time to avoid a collision. Somehow, the guys make it to the finish line alive, enabling Ric to present Hit the Road: India at the 2014 Chicago South Asian Film Festival. Ric spoke of plans to turn Hit the Road into a series, filming other adventurous road rallies around the world. It’s a natural fit for The Travel Channel, PBS, or even Netflix. With more corporate financial backing, future editions could add some neat features. Onscreen text in Hit the Road: India notes the day of the race and the remaining distance to Chennai, but a map graphic could give a sense of how far the racers travel each day. A bigger budget could also enable the filmmakers to follow more than one team. Ric & Keith’s adventures are captured by a dash-mounted camera as well as a camera crew in a pace car that drives alongside them. By only following one team, it’s hard to get a sense of how the actual race is unfolding (especially since Ric & Keith are almost always in last place). All of the other racers are introduced by name during the closing credits, and until then, I had no idea that so there were so many women participating. One team consists of three women from the United Kingdom and Australia. It would’ve been fascinating to see how they fared in a country with a troubled history of gender inequality and a well-known lack of public restrooms for women. 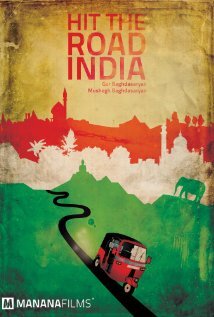 Hit the Road: India presents an interesting side of the country as well as a great first entry into what should be a series. I can’t wait to see where Ric & Keith Hit the Road next. 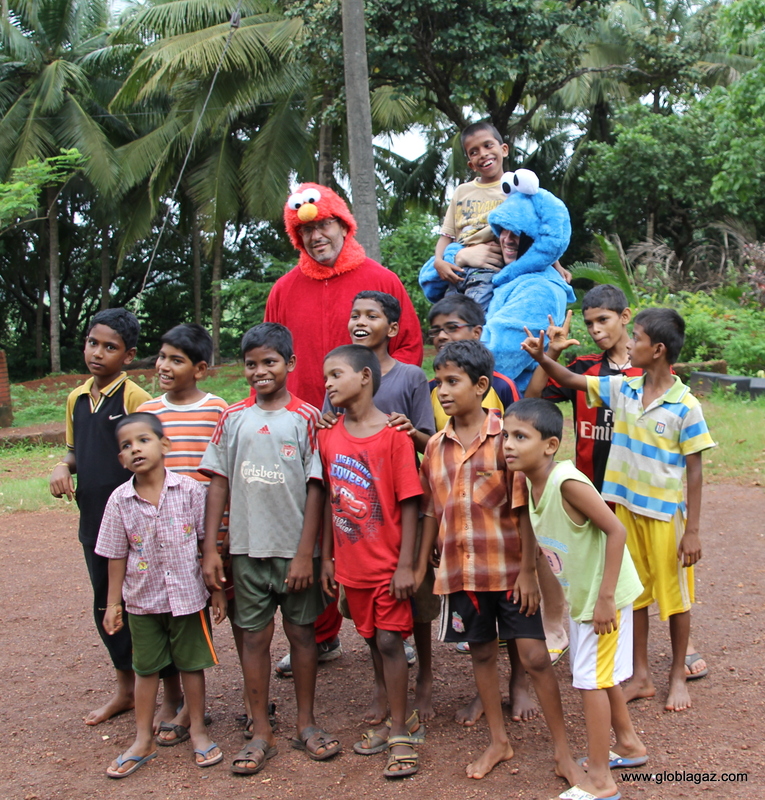 This entry was posted in Reviews and tagged 2013, 3 Stars, Documentary, Hit the Road: India, Indian, Keith King, Movie Review, Mumbai Xpress, Ric Gazarian, Rickshaw Challenge on October 16, 2014 by Kathy.